Everyone uses a cell phone these days but are you keeping your expensive land line just for the sake of your security system? Ranger American can turn your alarm into a wireless, online security system by switching out the phone line with a high security cellular communicator that connects you to our central station. There's no need to "uninstall" your existing unit adding on the accessory updates the whole system instantly. 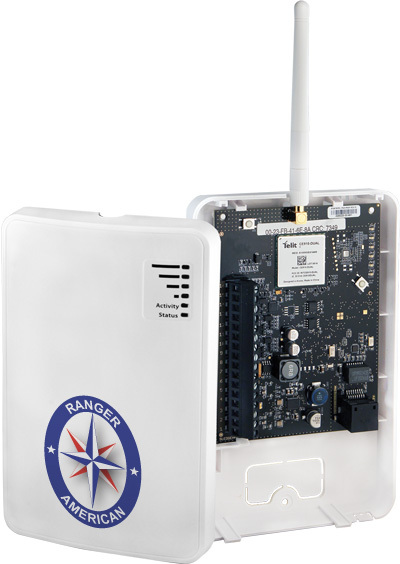 With Ranger American Wireless, you'll be able to arm and disarm your alarm system remotely from your smart phone or tablet. Turn the system on as you leave for the day; if you forget, just turn it on when remember - wherever you are. How convenient! Instantly after upgrading to Ranger American Wireless, you can start experiencing the advantages of complete control over your alarm system. In addition to remotely arming and disarming, that includes receiving text message notification when an event happens in your home. Contact Us today to upgrade your equipment to Ranger American® Interactive Wireless for $199 or upgrade for FREE with an existing Ranger American® system and new interactive wireless monitoring contract.